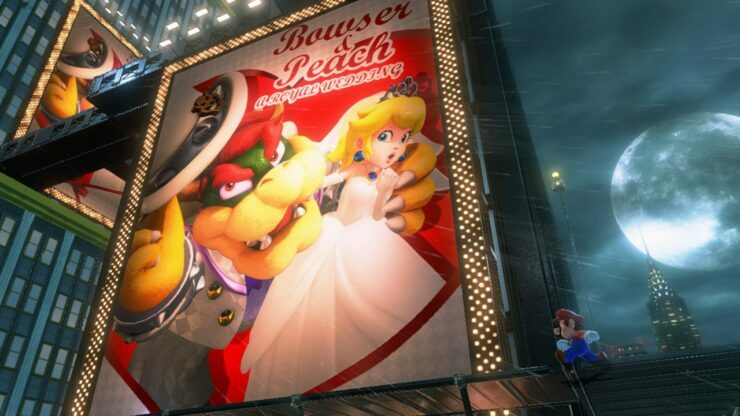 Mario’s been through his fair share of trials while courting Peach, his somewhat apathetic potential bride-to-be. He’s had to journey through a castle filled with paintings that hold entire universes, he’s been arrested for graffiti, he’s flown through space – twice! – and he turned into a cat. Now Mario’s back, and he’s not happy just exploring a castle or the vastness of the galaxy – he’s going on an Odyssey. Nintendo have made this clear; Super Mario Odyssey isn’t like Super Mario Galaxy or Super Mario 3D World. Rather, Odyssey takes after Super Mario 64 and Super Mario Sunshine – instead of jumping into fairly linear levels that you’ll effortlessly hop, skip and jump through, instead you’re met with a sandbox-style environment where items are hidden absolutely everywhere. 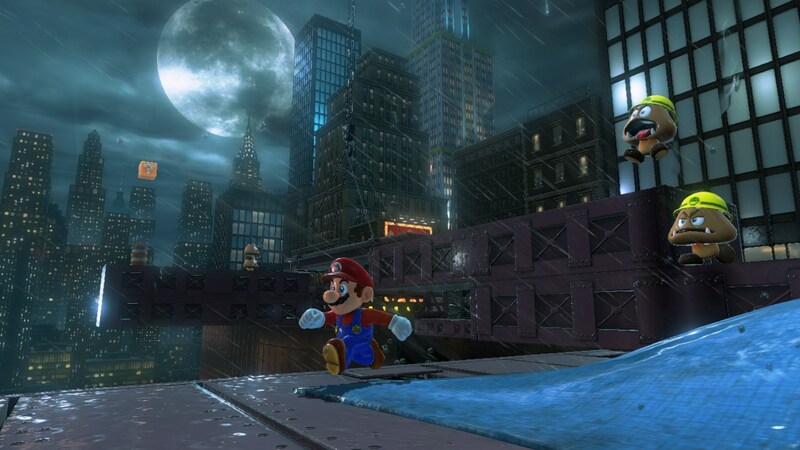 The game’s metropolis, New Donk City, is just one of the first new sandboxes you’ll be able to unearth secrets from – and there’s just so much to find. You can find Power Moons – the big new collectible – in almost every nook and cranny. Almost as soon as I started the demo, I had a Nintendo PR chap inform me that I’d missed a Power Moon. They are absolutely everywhere and hidden to keep players sharp-eyed. Heck, even in one maze-like area I found via Warp Pipe, the Power Moon found at the end of the maze isn’t the end – in fact, there was another Power Moon hidden away in the room, just for players that are willing to look a bit harder. Moving into the city center Mario can ride a small moped, skip with residents in the park, recruit a band for Mayor Pauline and, just, loads more. 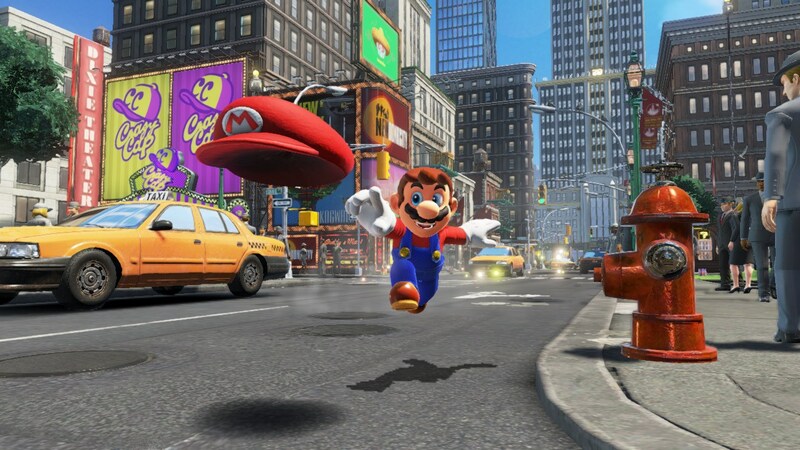 When running around in Super Mario Odyssey, I never felt like I had nothing to do, instead, I was constantly being led along by my nose because everywhere I went, there was something I wanted to do, something I wanted to interact with, whether that was climbing a building or moving inside some red girders to grab another Power Moon. Each level now has a Crazy Cap store that you can buy items and clothes from – Mario’s Black Fedora and Pinstripe Suit combo being a surprisingly dapper look. Items can be bought, either with Mario’s usual coin stash or with the 100 unique Purple Coins in each level. 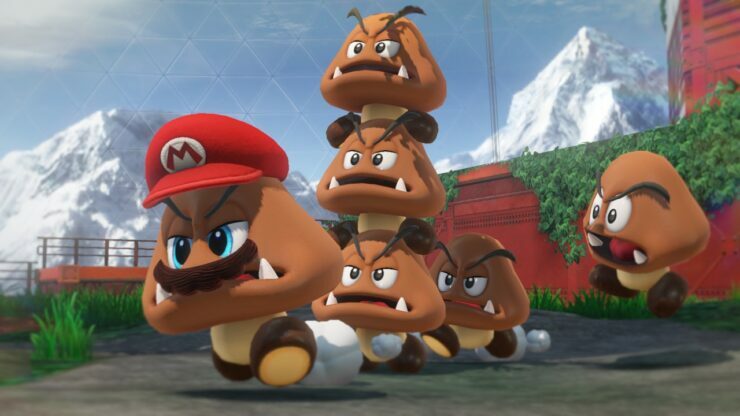 The Purple Coins do a good job of giving Mario more things to grab while in each world, while still giving them an actual purpose – each one isn’t just a mark towards a 100% completion rating, there’s still costumes and more Power Moons to be bought with them. The Desert level is just as fascinating – seemingly, no matter which direction you head in, there’s something to be found, and offers the first look at Mario’s ability to possess people within his world, merely by flicking his hat on their heads. Controlling Bullet Bills to grab far-afield Power Moons, or taking control of an animate statue to see where the hidden platforms are in the level – these are really cool uses of Mario’s new ability, which expand the amount of actions he can perform in the world. Which is great, because Mario’s always been about being mobile, and in Super Mario Odyssey he has some new tools at his disposal. Moving Mario actually feels slightly weightier than he did in Super Mario Sunshine, though you’ll find all of his usual moves in the right places – Somersaults, Crouch Jumps, Long Jumps, they’re all here and accounted for, with some new additions. The hat makes a big difference, actually – Mario can flick out his hat with Y, and hold the button down to hold the hat in place, allowing you to use it as an extra platform. Combos can be strung together – long jump, into hat throw, into aerial dive, for example, will result in a much longer and more impressive jump than what has been possible in the past, and the surprising amount of dexterity and accuracy required in the inputs make this a surprisingly risky and satisfying move to pull off when hovering over a bottomless chasm. Super Mario Odyssey is thus far filling out to be one of the best Mario games ever – I could nitpick that, for example, the resolution doesn’t seem to be particularly high, but then, the game is aiming for a (mostly) stable 60FPS, which is a lot better than increased pixel density anyway. Assuming Super Mario Odyssey’s quality keeps up throughout, this will be an essential Switch title, and, just perhaps, one of the greatest Mario games of all time.